It’s about time for sweat and tears to hit the floor in Trojan Arena. 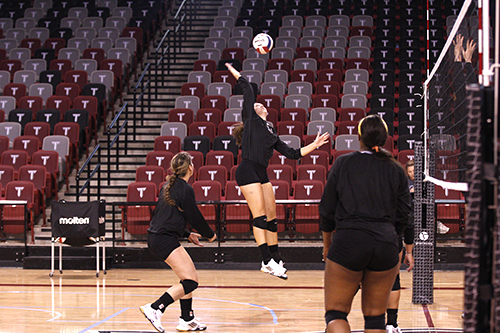 With Sartain Hall the past and Trojan Arena the present, the Troy volleyball team will take the court against Georgia Southern in its home opener on Monday, Sept. 2. The Trojans were 21-12 last season, their best record under Head Coach Sonny Kirkpatrick, who is now entering his eighth season. Of Kirkpatrick’s seven seasons at Troy, three of them have been spent training his two seniors, Courtney Cohen and Alexandra Alexander. Cohen in set for a historical senior season with her 1,519 career digs, which is 210 shy of setting the Troy’s career dig record. “I know that Courtney will beat the record. I have no doubt in her abilities,” Kirkpatrick said. Joining the two seniors on the court will be six returning players, as well as the six new players the Trojans added to their roster this season. “I am really pleased with the new girls. They are fitting in perfectly with the team,” Kirkpatrick said. Adding to the excitement this year, the Trojans will be hosting the Sunbelt Conference Tournament in Troy this fall. Sunbelt Conference play this season begins and ends against Western Kentucky, and the Trojans lost both times last season against the Lady Toppers, who will leave the conference at the end of the 2013 season.